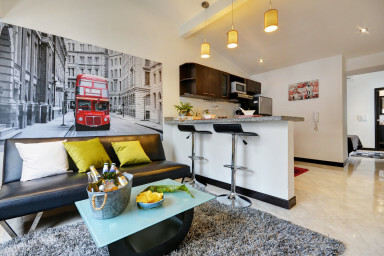 All of the Poblado suites adhere to a sleek and modern design offering brand new furniture, fixtures, and appliances. The suites offer a fully furnished/equipped kitchen, bathroom, living room, office space and a bedroom. Imagine returning to your stylish apartment after a vibrant evening in Parque Lleras. Hungry, you make food with the fully functioning kitchen before relaxing in the den for a cozy movie experience. After the movie sleepiness takes over and you retire to the comfort of your welcoming bedroom. Sofa-bed in the living room. The apartment is walking distance to almost everything you'll want to do while you're here and for the other locations, taxi's are easy to call and are metered so you don't have to worry about overpaying. The metro station is a 10 minute walk down the hill.